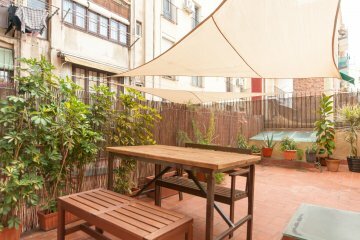 Cosy and carefully furnished and decorated, these self catering apartments in Barcelona are a great option to stay in Barcelona. 75m2 with 2 double bedroom and a very comfortable and spacious bathroom. From one of the bedroom you can access the small indoor patio where you can enjoy your tea time or a glass of wine. The kitchen corner is very stylish, and it is fully equipped including a dishwasher. You can also enjoy free wifi and air conditioning and heating in the whole apartment. In the building there are a total of 10 apartments, and there is a new elevator and free wifi in the whole building.